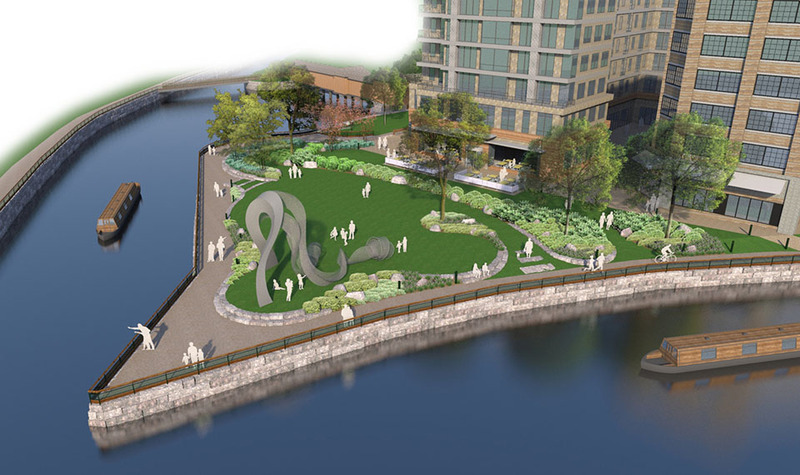 CRJA-IBI Group is working with the City of Lowell Department of Planning and Development to design the new Point Park, a ½ acre public park at the confluence of the Pawtucket and Hamilton Canals, overlooking the historic Swamp Locks and bounded on two sides by historic canal walls, and the canals themselves, thus giving the park its name. The park will accommodate passive recreation and historic interpretation for tourists, as well as residents of the newly emerging Hamilton Canal District, and form a foreground for future residential mid-rise towers when viewed from the heavily traveled Thorndike Street Bridge across the canal. Given the high visibility, the City of Lowell commissioned an artist to create a monumental sculpture to be set at the high point of the park lawn, and retained CRJA-IBI Group to work with the artist for the scale and setting of the sculpture.